It’s hard to talk about The Aftermath without comparing it to another film about a love triangle set against a World War II backdrop: Casablanca. Both films even feature a pivotal scene in which the leading lady must decide whether or not to get on a train that’ll take her to a new life. Considering that Casablanca is one of the greatest movies of all time, The Aftermath was bound up come up a little short no matter how you look at it. Taking Casablanca out of the equation, though, does James Kent’s film stand on its own merits? The short answer is, “yes.” The long answer is a bit more complicated. From Pride & Prejudice to Colette, it seems like Keira Knightley is trying to break the record for the actress who’s starred in the most historical dramas. She’s also likely broken the record for most period dresses worn by a contemporary actress. In The Aftermath, she sports another ravishing wardrobe as Rachael Morgan, the wife of a British colonel named Lewis (Jason Clarke). Although World War II is officially over, there’s still work to be done in Germany. Much to Rachael’s surprise, Lewis has arranged for them to share a house in Hamburg with a German family that previously owned the residence. Alexander Skarsgård plays Stefan Lubert, a German man who lost his wife in the war. The only person he has left is his daughter Freda (Flora Thiemann), who’s been distant ever since her mother died. At first, Stefan and Rachael in particular aren’t pleased to be living under the same roof. The more time the two spend with each other, though, it becomes clear that they’re both overwhelmed with grief and loneliness. As Lewis grows increasingly distant, Rachael inevitably falls into Stefan’s arms, leaving her with a heartbreaking decision to make. 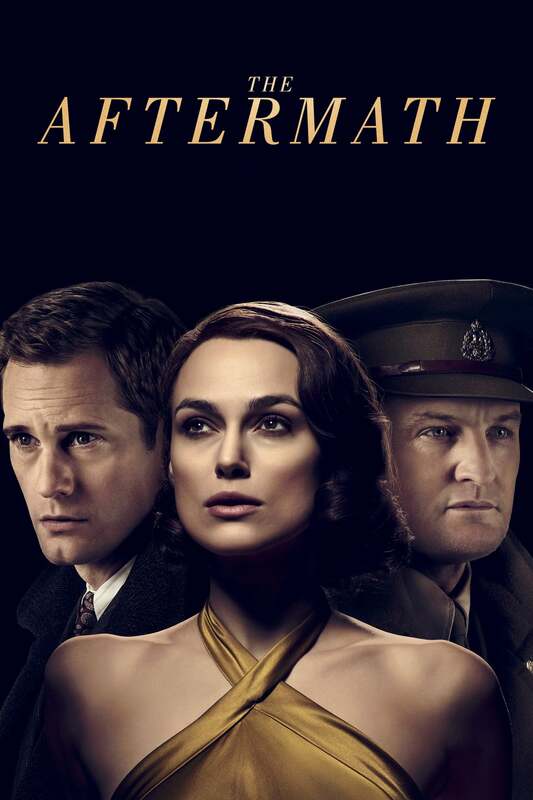 Knightley, Skarsgård, and Clarke all turn in effective performances that often excel above the occasionally soapy material. Even at the film’s most melodramatic, this trio of performers all create sympathetic characters with identifiable inner demons. It’s refreshing to see a love triangle where there isn’t an obvious villain. There isn’t even really an obvious “other guy,” as Rachael shares a strong connection with both men and we’re genuinely invested to see who she’ll ultimately choose. As entertaining as the romance is, one can’t help but wish the film had delved deeper into the war that brought these characters together. The message of The Aftermath is evident: whether you were German or British, World War II had unspeakable side effects on both sides. Not all Germans were Nazis and many of them simply wanted the war to end. This would’ve been made much more powerful, though, if the conflict between the Germans and British was further explored. Outside of a few people who harass Stefan, the central theme of prejudice can feel glanced over at times. Even Rachael’s hatred towards the Germans comes off as more of an annoyance. Had the tension between the characters been more challenging, the film would’ve made for a more complex character study. For what it is, however, the acting is involving, the production values are impressive, and the love story is never dull. Even if The Aftermath doesn’t reach its full potential, at least we’ll always have Paris. This entry was posted in Reviews and tagged Drama, Romance, War on March 21, 2019 by Nick Spake.